The U.S. Fish and Wildlife Services said on Monday that four scientists are in the path of a category five hurricane threatening Johnston Atoll, an isolated atoll in the central Pacific Ocean. 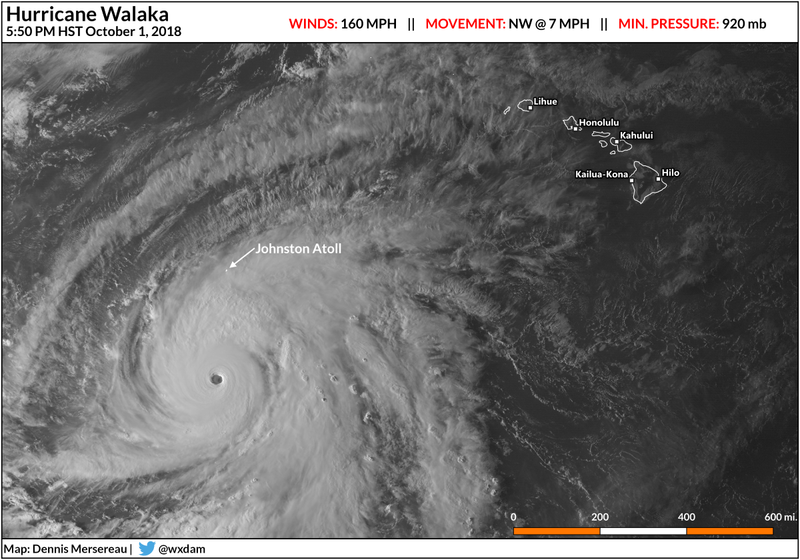 Walaka is one of the strongest storms we've seen in the Northern Hemisphere this summer, and its strongest winds may come within a few dozen miles of the tiny island on Tuesday. The latest advisory from the Central Pacific Hurricane Center pegged Hurricane Walaka's maximum sustained winds at 160 MPH, making it a category five on the Saffir-Simpson Hurricane Wind Scale. Walaka is the second such storm in the central Pacific basin this year; Hurricane Lane reached the top of the scale before approaching Hawaii in August. 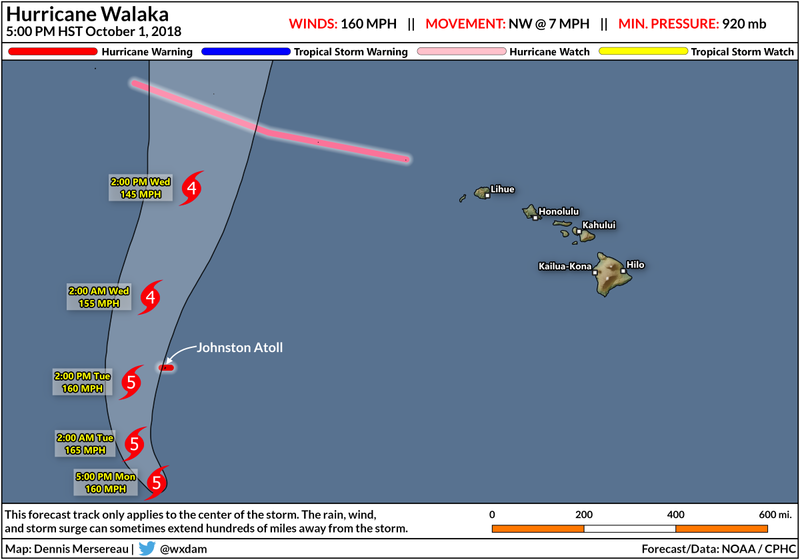 Current forecasts bring Walaka's eye within a few dozen miles of Johnston Atoll on Tuesday afternoon. If the predictions hold true, the atoll would fall on the eastern edge of the eyewall, potentially subjecting it to some of the storm's strongest winds and highest storm surge. Rough waves and storm surge could easily cover much of Johnston Island, most of which lies within a few feet of sea level. Johnston Atoll is located in the central Pacific Ocean about 800 miles southwest of Honolulu, Hawaii. Johnston Island, the atoll's largest feature, is mostly man-made, measuring about two miles long and about half a mile wide. 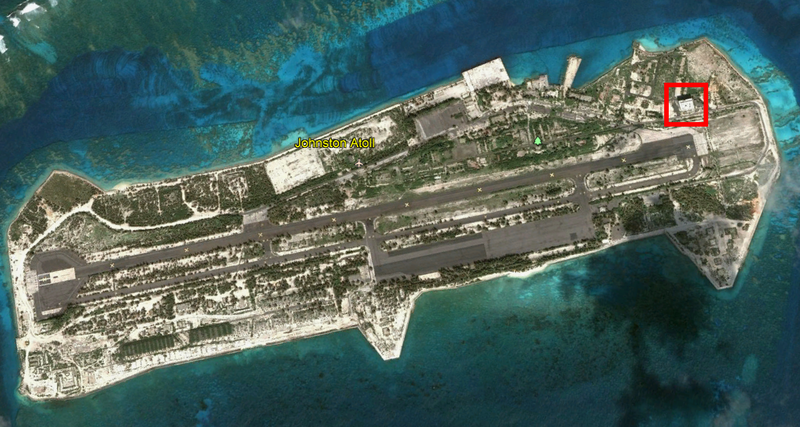 The island consists almost entirely of a runway and various (largely abandoned) government installations. Johnston Island played a role in the development of the United States' nuclear arsenal. Numerous nuclear tests were conducted there during the height of the Cold War, and Johnston Atoll was heavily contaminated by radiation after the failure of Bluegill Prime on July 25, 1962. The island's population peaked around the turn of the millennium during the effort to rid the island of pollution from both radiation and Agent Orange, large containers of which were stored there after the Vietnam War. In preparation for any possible impacts from Hurricane Walaka, the field biology crew secured the year-round field camp. We are working with the U.S. Coast Guard to evacuate the four field crew members on Johnston Island, if weather and circumstances allow. Currently, on island staff are sheltering in place at a steel and concrete structure built to withstand hurricanes. We are continuing to monitor Hurricane Walaka as it moves through the Pacific and will stay in close coordination with the U.S. Coast Guard as the situation evolves. The spokesperson added that herbicides, insecticides, and propane tanks were secured before the staff took shelter. The structure referenced by the agency, pictured in the red box in the Google Earth snapshot above, lies on the northeastern side of the island. Walaka (and its strongest winds/surge) are approaching the island from the south. This may somewhat blunt the effect of storm surge flooding if the crew can't evacuate. A hurricane watch is in effect for the Papahanaumokuakea Marine National Monument, the long chain of tiny islands and atolls that extend for a thousand miles northwest of the main Hawaiian Islands. The center of the storm is not likely to affect any of the northwestern Hawaiian Islands with the capability of supporting a research population. 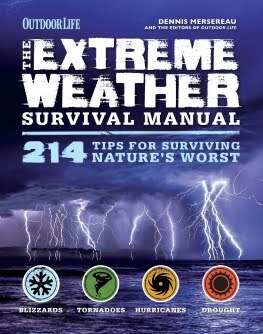 The storm will not affect the seven populated islands of Hawaii, though rough surf and rip currents are possible along south-facing shores as the storm passes far to the state's west.